Sometimes as developers we find ourselves locked out of the Informatica PowerCenter environment preventing us from verifying if a particular folder, target, source or parameter file exists in the PowerMart directory. Using a Java Transformation provides a potential solution to this problem. The following will explain how to build a Java Transformation that takes as input the PowerMart root directory or any directory the Informatica PowerCenter account has access to and return information about all the files within the directory and its sub-directories as rows. First, create a Java Transformation with the Input and Output ports illustrated on (A.1). When asked the transformation type make sure Active is selected. 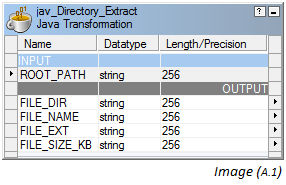 An active Java Transformation will allow for multiple output rows to be generated from a single input row which is the behavior need to generate all directory file entries from the root directory. Select the Helper Code sub-tab to add the functions that will traverse the directory folder and retrieve the information for each file in the path. Now the Java Expression has everything it needs to generate all the file directory entries from the PowerMart directory or any directory the Informatica PowerCenter account has access to. In the mapping where the Java Transformation is to be used, select Parameters and Variables… from the Mappings menu bar. Add a new variable and name it something like $$ROOT_DIR, set it as a type of Parameter, as data type of string and with a precision long enough to hold a directory name, 256 for example. Set the Initial value: as $PMTempDir. Create an Expression with an output port that uses the variable $$ROOT_DIR and pass it to the Java Expression.